I'm glad to be member of this club! The body style is so comfortable to play. Last edited by rzbk777 on Sat Jul 08, 2017 4:43 am, edited 2 times in total. Within the next 2 weeks mine will be here!! Can't wait! Mtngirl wrote: Within the next 2 weeks mine will be here!! Can't wait! At least 8 more weeks for mine . Is yours a 6? rzbk777 wrote: I'm glad to be member of this club! The body style is so comfortable to play. That is so flippin' sweet altogether! Thanks! I love it more every time I play it! Had my Vanquishfor a month now. Sweetest neck I have ever played and I was an Ibanez neck lover. 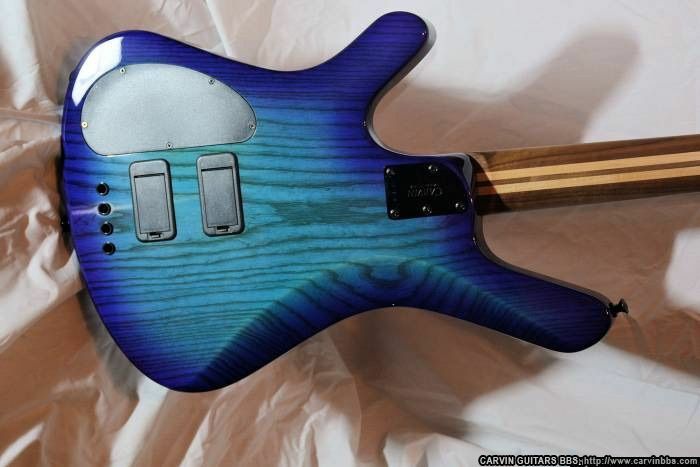 These guitars are of high quality but are also stunning in all of the build choices. Enjoy. Finally got mine in about a week ago! Woahoah! Yup, I officially love this model. That Zirocote top is out of this world! robm66 wrote: Finally got mine in about a week ago! THAT is one of the most unique, intriguing builds on the face of the earth. Everything about it is individual--not to mention gorgeous. Congrats on a real one of a kind beauty! Agreed, that thing is awesome! I saw this picture while looking up nightbursts and think that this would be, with some minor tweaking, a SUPER cool and original shape. You could call it a Reverse Vanquish (or if you want to get cute like Gibson and claim the original was the reversed one, call it a non reverse Vanquish). I think it's pretty slick looking, has a sort of Firebird / RD quality about it. Am I out to lunch here (don't answer the question GENERALLY because I know the answer already lol), or would this look pretty cool strung up with close to this exact shape? To me it looks like it should be mounted on top of a jeep with a bandolero of .50 caliber bullets trailing behind it. I like it. Sure if you never play above the 18th fret. Bit of an Iceman vibe. That is a shockingly gorgeous top. You've been doing some really crazy, creative builds lately, JCG. Love it. John, that REALLY came out looking fantastic. That's one of the nicest non-clear finish Vanquishes I've ever seen. The two colors play off of each other really well, and the color choices are great... the cream 22's rhyme with the board.. well done. My V69K. I'd post some of the pics I've taken of this bass, but the uploader won't accept them.